If you notice your washing machine, dishwasher, shower, or any indoor or outdoor faucet in the house causes your water pipes to make noises, especially when turning water off, you’re not alone. And since you’re not alone, it means there is a common problem that is causing these noisy pipes in your house. Let’s describe the type of noisy pipes to make sure this is your same problem: pipes could be said to be banging, rattling, clanking, hammering, vibrating, knocking, pounding, shaking, etc. If this sounds like your noisy water pipes then read on. We know that a water main brings water to your house and then through a series of water pipes to deliver water all around your house. This water is generally under great pressure; nothing your plumbing can’t support and definitely not something that causes any loud noises in the plumbing. This water pressure makes it possible for water to flow instantly out of a faucet when we turn it on. As soon as we open a valve (or an appliance like a washer does), the water floods through your pipes and out the open end. Again, aside from the sound of water rushing through pipes or out fixtures, there is nothing strange about these sounds. It’s worth noting that while noisy pipes may seem harmless to your plumbing, the shocks generated from water hammering can cause stress to your pipe joints, weakening them over time. How to fix or stop noisy “hammering” in your pipes? Fortunately, newer homes have remedies in place for “hammering” pipes due to what is described above. But if you’re reading this, chances are your home is older, with older plumbing. ‘Modern’ homes have in place what’s called a water hammer arrester. These little devices are affixed directly onto your pipes and are about the size of softballs if round, or a banana if cylindrical. What they have is a small chamber divided in two by a rubber diaphragm. On one side is water and the other, air. When the water that’s charged with the energy gained from a suddenly closed valve hits the diaphragm, it dissipates by vibrating the rubber diaphragm back and forth. And it does this without making any noise! 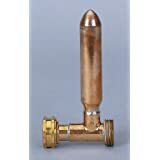 Here are some examples of a water hammer arresters – click here and here for ball-shaped type. While it looks a little funny, this little device certainly does the trick. Order one today, and silence those pipes once and for all.